A similar claim has been referenced before in relation to the NewBuy Guarantee scheme, which provides buyers in England with up to 95% mortgages for new builds. It was claimed that the introduction of the scheme meant that "instead of a typical buyer requiring a £40,000 deposit for £200,000 property, they will now only need £10,000" in the press release launching the scheme. The figures from the press release aren't sourced. We've asked the government what these figures are based on. In any case, this particular scheme is only available for new builds. This is an accurate reflection of Shelter's research. Shelter estimated that under the Starter Home scheme families on the National Living Wage would be able to afford homes in 2% of local authorities in England in 2020 (excluding two with limited data). This equates to eight local authorities. Starter Homes are available to first-time buyers under the age of 40. A family was counted as a couple with one child, where a man works full-time and a woman works part-time. There aren't official figures for the prices of Starter Homes, nor for exactly what the National Living Wage will be in 2020. Shelter has based its analysis on the median house price in each local authority in 2014 and projected this to 2015 and 2020 based on the estimated growth in house prices. These prices were then reduced by 20% to reflect the discount that will be offered for Starter Homes. The income level was calculated by taking the government's commitment for the National Living Wage to be over £9 an hour by 2020, and took existing estimates of full-time and part-time working hours. Shelter says there are reasons to think that these homes will be sold at close to the median price, for example because it says new builds are historically more expensive than older homes. That's right. Levels of nitrogen dioxide at Putney High Street had exceeded one of its yearly EU limits by 8 January. That's according to the London Air Quality Network, which is run by King's College London. It monitors the average concentration of nitrogen dioxide over one hour periods. This hourly concentration should not hit a certain level—200 micrograms per cubic metre—over 18 times in one year, according to a limit set by the EU. The concentration at Putney monitoring station overshot that level for the 19th time in 2016 during morning rush hour on 8 January. That's nearly right—official figures show 44,000 'excess deaths' last winter in England and Wales. In the past four years there were 117,000 such deaths. Here, 'winter' means the four months from December to March. The number of deaths in winter is consistently higher than at other times of year, and the 44,000 excess deaths can be seen as the difference. Last winter was a bad one—excess deaths were the highest they'd been since the winter starting in 1999. But the number of deaths does tend to vary quite a lot. The winter before last, in 2013/14, had the lowest yet. 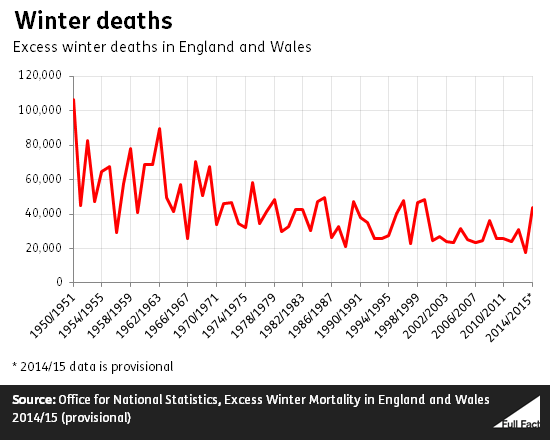 The longer term trend has been for the number of excess winter deaths to fall. The reasons behind the deaths are complicated. Colder winters are associated with more deaths, according to the health regulator NICE, which says that "housing conditions are a very important factor." That can be about the quality of the home itself, for instance the amount of insulation. It can also be about the ability of the household to pay for heating. This is about right. Figures from energy market consultants Cornwall Energy for October last year indicate the 'big six' firms account for about 86% of the 'dual Fuel' energy market and 88% of each of the electricity and gas markets. We've asked the Department for Energy and Climate Change (DECC) to confirm where the Prime Minister's '15%' figure might come from specifically. The 86% share for the big six is much lower than a few years ago. 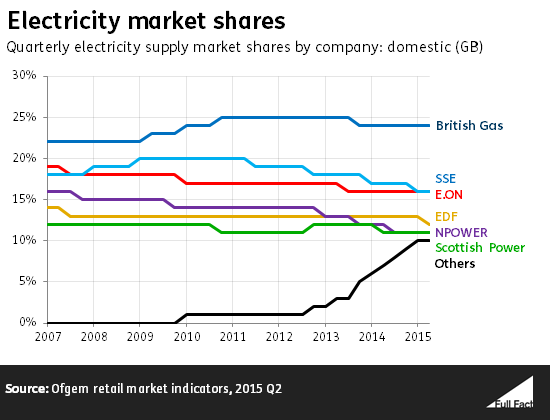 The big six's market share was over 99% before 2012 on the same measure. That's been falling ever since and other measures of market competitiveness show the same trend. Yet more estimates come from energy regulator Ofgem, and these broadly show the same thing. 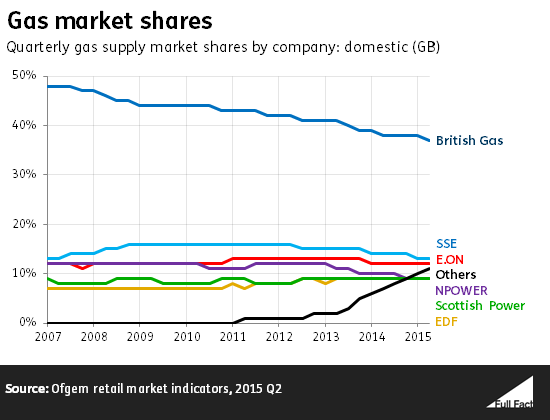 The market share of companies outside the big six has been increasing in the last few years. "It is unclear that any single existing supplier will achieve sufficient scale in the near term to act as a disruptive constraint on the six largest suppliers across the market". This is right, but not all that useful. The figures compare September 2010 to September 2015, which is the best comparison possible with the available data from the Office for National Statistics. Of a rise of about 2.3 million people employed in the private sector, 64% happened in regions outside London and the South East. But about 70% of private sector employment is outside London and the South East anyway, so accounting for only 64% of the rise shows that the rest of the country is relatively lagging behind. London's share of private sector employment has risen since 2010 while most other regions have seen their share fall. As of last summer, there were 6.2 million children being taught in schools ranked good or outstanding, 1.4 million more than in 2010. This is set against a backdrop of rising pupil numbers, but the proportion of pupils in good or outstanding schools has been rising too. There's no doubt that schools' Ofsted performance is improving. This progress is partly due to Ofsted's changing inspection practices—it redefined what was expected of schools and placed a greater emphasis on inspecting schools which fell below this expectation. See our factcheck for more information.